The Jelly iPhone App is Quora for your life. You ask questions, and Jelly iPhone app users share their perspectives. This crowd-sourced guide to life has an important edge on Quora’s iPhone app with its effective, sophisticated interface. 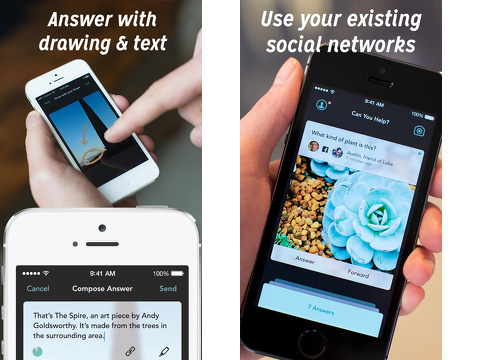 Jelly is visually appealing and includes cool social engagement tools. The Jelly iPhone app encourages you to link existing accounts to create a better experience. The Facebook authorization requires access to your profile, checkins, and likes. The Twitter authorization is quick and painless. Jelly states that it does not post without authorization. You also authorize access to your location to improve the algorithm. The home screen is a cool, new approach to a social feed. It is focused on one question, not a constant stream of questions and images that you scroll through until something grabs your attention. Each question has a beautifully framed interface. At the top, the question is shared with a photo of the user who posed the question and a social engagement tally. 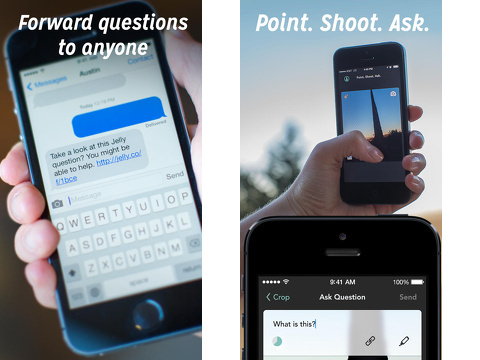 A photo fills the middle, and three options are at the bottom of the question interface – good, answer, and forward. The answer interface allows you to type your response, as well as insert a link and draw on the photo to visually illustrate your answer. This is a great tool when someone is asking how to use an app’s interface or give directions. The forward icon allows you to share using iOS pop-ups to SMS, email, Twitter, and Facebook. If you want to follow the discussion, you tap the star in the upper right corner. The answers to the question are stacked like tabs at the bottom of the screen. You swipe up, and the answers fill the middle of the screen. You swipe through the answers horizontally. Users rate a response as good, and you may also answer with a thank you card. This is a thoughtful reinterpretation of traditional customs. The current users for the Jelly iPhone app seem to be early adopters. For that crowd, they love to pose questions, tweet, and engage with fervor and passion. At this point, Jelly is not accessible to the masses who prefer to like, repin, and retweet. The Jelly iPhone app does have a compelling hook, and the interface is intuitive. With time, it has the potential to be an exciting tool to expand your knowledge and life experience with your iPhone. AppSafari review of Jelly was written by Jenni Ward on March 12th, 2014 and categorized under App Store, Free, Fun, Productivity, Reference, Social. Page viewed 6893 times, 2 so far today. Need help on using these apps? Please read the Help Page. Very beautiful, I like it very much. I think This is an incredible apparatus when somebody is asking how to utilize an application’s interface or give headings. The forward symbol permits you to impart utilizing ios pop-ups to SMS, email, Twitter, and Facebook. On the off chance that you need to take after the examination, you tap the star in the upper right corner. Jelly is a awesome app. I loved Jelly when I played.